Okinawan martial arts refers to the martial arts, such as karate, tegumi and Okinawan kobudō, which originated among the indigenous people of Okinawa Island. Due to its central location, Okinawa was influenced by various cultures with a long history of trade and cultural exchange, including Japan, China and Southeast Asia, that greatly influenced the development of martial arts on Okinawa. 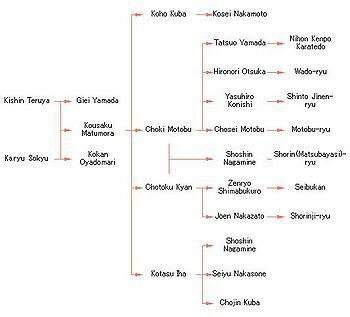 In 1429, the three kingdoms on Okinawa unified to form the Kingdom of Ryukyu. When King Shō Shin came into power in 1477, he banned the practice of martial arts. Tō-te and Ryukyu kobudō (weaponry) continued to be taught in secret. The ban was continued in 1609 after Okinawa was invaded by the Satsuma Domain of Japan. The bans contributed to the development of kobudō which uses common household and farming implements as weaponry. The Okinawans combined Chinese martial arts with the existing local variants to form Tōde (唐手, Tuudii, Tang hand, China hand), sometimes called Okinawa-te (沖縄手, Uchinaa-dii). 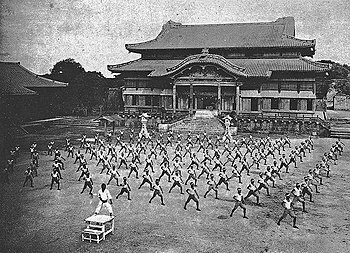 Shuri-te (首里手, Okinawan: Suidii) is a pre-World War II term for a type of indigenous martial art to the area around Shuri, the old capital city of the Ryukyu Kingdom. 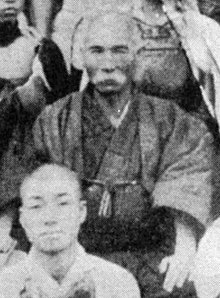 The successor styles to Shuri-te include Shotokan, Shitō-ryū, Shōrin-ryū, Shudokan, Shōrinji-ryū, Gensei-ryu and Motobu-ryū. Tomari-te (泊手, Okinawan: Tumai-dii) refers to a tradition of martial arts originating from the village of Tomari, Okinawa. Naha-te (那覇手, Okinawan: Naafa-dii) is a pre-World War II term for a type of martial art indigenous to the area around Naha, the old commercial city of the Ryukyu Kingdom and now the capital city of Okinawa Prefecture. The successor styles to Naha-te include Gōjū-ryū, Uechi-ryū, Ryūei-ryū, Shito-ryu and Tōon-ryū. ^ Okinawan Masters. msisshinryu.com. Retrieved on 2011-06-20. ^ Higaonna, Morio (1985). Traditional Karatedo Vol. 1 Fundamental Techniques. pp. 18–19. ISBN 0-87040-595-0. ^ "Tomari-Te: The Place of the Old To-De". Retrieved July 25, 2005. ^ "Koshinrin School of Karate: Katas". Archived from the original on May 17, 2005. Retrieved July 25, 2005.